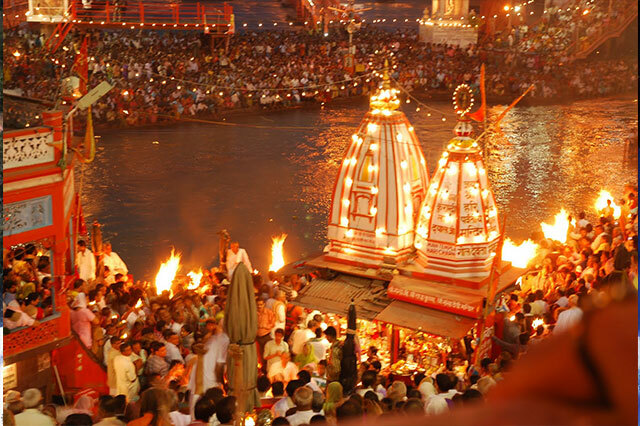 Haridwar is a holy city in the state of Uttarakhand in northern India. Known as the Gateway to the Gods, Haridwar is considered one of the seven holiest places according to Hindus, as the devas are said to have left their footprints there. Here pilgrims float diyas on the Ganges, to commemorate their deceased ancestors. The city also stands as a gateway to three other important pilgrimage destinations: Rishikesh, Badrinath, and Kedarnath. In Haridwar you will see a great statue of Shiva at the fork of the river. If you are there for a short visit, it is definitely worth to visit the temple on top of the mountain, with a wonderful view. Haridwar is also an ancient city and important Hindu pilgrimage site in North India's Uttarakhand state, where the River Ganges exits the Himalayan foothills. The largest of several sacred ghats, Har Ki Pauri hosts a nightly Ganga Aarti in which tiny flickering lamps are floated off the steps. Worshippers fill the city during major festivals including the annual Kanwar Mela.